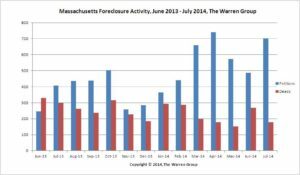 Petition activity in the Bay State continued to climb in July, with a 72.5 percent rise in foreclosure starts compared with the same month last year, according to the latest report from The Warren Group, publisher of Banker & Tradesman. Petitions to foreclose mark the first step in the foreclosure process. 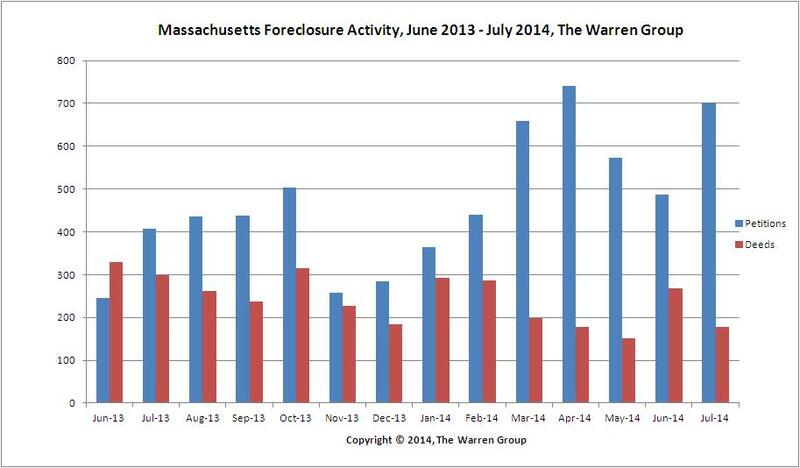 Lenders filed 702 petitions to foreclose in July compared with 407 filings recorded in July 2013. This marked the fifth consecutive month of year-over-year increases in petition filings. So far this year, 3,966 petitions were recorded, up 20.2 percent from the 3,300 starts filed during the same period a year ago. Foreclosure deeds dropped significantly in July, recording a 41.0 percent decrease with 177 deeds filed compared with 298 in July 2013. This marked the fourth consecutive month of decline in deeds. Year-to-date, a total of 1,552 foreclosure deeds have been filed so far this year, a 17.3 percent drop compared with the 1,876 deeds recorded during the same period last year. Deeds represent completed foreclosures. The Warren Group also tracked the number of auction announcements in July. Auction announcements increased almost 5.0 percent to 552 from 526 in July 2013. From January through July, 2,758 auctions were announced, a 10.9 percent decline from the 3,094 auctions tracked during the same period in 2013.